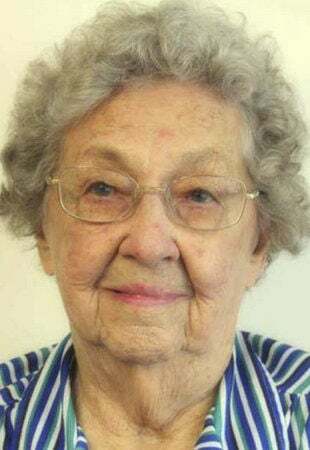 ARCADIA — Lydia Lehecka Luedtke Bruha, 97, of Arcadia passed away Thursday, April 11, 2019, at the Valley View Senior Village in Ord. Services will be 10:30 a.m. Monday at the United Methodist Church in Arcadia with the Dr. Rev. Jeff D. Hale officiating. Burial will be in the Arcadia Cemetery. Visitation will be from 3 to 5 p.m. Sunday at the church. In lieu of flowers memorials are suggested to the Arcadia Fire Department or the Arcadia United Methodist Church. Ord Memorial Chapel is in charge of arrangements. Lydia was born Oct. 22, 1921, on a farm west of Ord to Vaclav and Barbora (Cadek) Lehecka. She attended several country schools and graduated from Ord High School in 1939. Lydia was a nanny in Ord to Dr. and Mrs. Joe Kruml and their four children. During World War II, she moved with the Kruml’s to Jefferson Barracks in St. Louis, Mo., where she lived for a year and a half. Upon returning to her parents’ farm north of Arcadia she began working in the rationing office in Ord where she was served as Chief Clerk until 1945. On Nov. 8, 1944, Lydia was united in marriage to Keith H. Luedtke. To this union two sons were born, Keith R. and Richard E. The couple first lived south of Ord until 1947 when they moved into Arcadia. Mr. Luedtke passed away in February of 1972. In March 1976, Lydia married Henry Bruha and gained a larger family. Mr. Bruha passed away in June 2003. From 1956 until retirement in 1986, Lydia worked for the United States Postal Service. Following her retirement she did volunteer work for Arcadia Public School, Arcadia United Methodist Church, Arcadia Booster Club, Salvation Army, Valley County Museum and the Ord Senior Center. She was very active in the United Methodist Church and was the Sunday school secretary and treasurer and treasurer for the Women’s Society. She belonged to the Rebekah Lodge and received the Decoration of Chivalry from the State Odd Fellow’s and Rebekah’s. Lydia was a proud blood donor, donating 32 pints of the blood to the American Red Cross. Lydia was honored to be selected as Grand Marshall of the 2018 Fall Festival Parade and recognized as the oldest living citizen in Arcadia. Lydia attended many of her family’s activities and hosted numerous family dinners. She enjoyed quilting, crafts, cooking, baking and doing crossword puzzles. She traveled to the Czech Republic, around the United States and Bermuda. Survivors include two sons and daughters-in-law, Keith and Linda of Lincoln and Richard and Diane of Arcadia; six grandchildren and their spouses, Jennifer and Tim Ripp, Melissa and Rob Scott, Ryan and Andrea Luedtke, Brandon and Lawnie Luedtke, Jeffrey Luedtke and Megan Luedtke and her fiancé Alex Dawe; seven great-grandchildren, Alec and Emily Ripp, Brook, Tyler and Collin Soderquist, Jenson and Beckham Luedtke, Carsen, and Lincoln Sue Luedtke; and three Bruha stepchildren and their spouses, Laddie H. of Ord, Robert and Twila of Comstock and Helen and Jim Hulinsky of Burwell. Lydia’s family also includes a host of step-grandchildren; step-great-grandchildren; relatives and friends. She was preceded in death by her parents; both of her husbands; four sisters, Emma Zabloudil, Elizabeth “Bess” Wilson, Agnes Foth and Mildred Lehecka; and three brothers, George, Robert and Lloyd Lehecka.